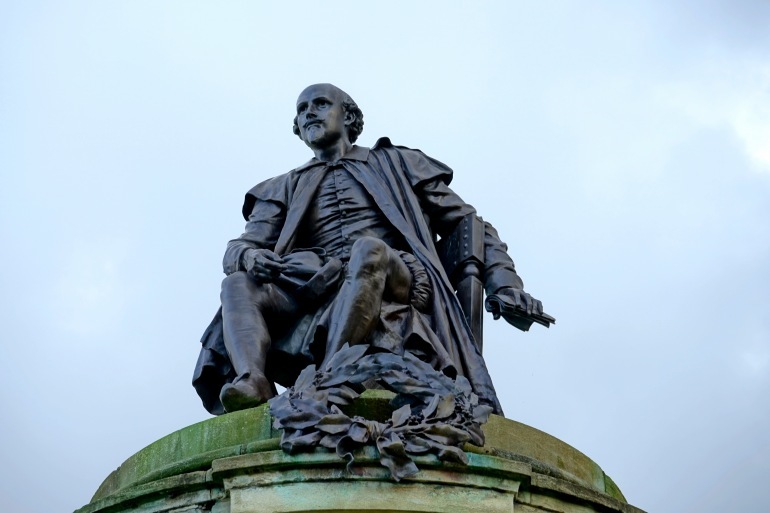 Join acclaimed Road Scholar theater expert Giles Ramsay and guest speakers on a complete immersion into the life and works of William Shakespeare. Enjoy a private reception at Shakespeare’s birthplace — a shrine to millions — and get a tantalizing glimpse into his world and take dinner in the RSC Rooftop Restaurant. Enjoy three performances at the Royal Shakespeare Company and two at the Globe, an amazing reproduction of the original Elizabethan playhouse. Day 2: Arrive, Check-in, Orientation, Welcome Dinner: Stratford-upon-Avon. Lunch: Take a light lunch in the hotel. Afternoon: Arrivals continue, with free time for those who have already arrived. At 5pm we will have an Orientation in the hotel. The Group Leader will greet everyone and lead introductions. This program is staffed with both a Group Leader, who will accompany us throughout the program and deal primarily with logistics, and Giles Ramsay, the Study Leader who will lecture, conduct field trips and serve as an information resource on program-related topics. We will review the program theme, the up-to-date Daily Schedule and any changes, discuss safety guidelines, emergency procedures, roles and responsibilities and answer any questions you may have. We have set aside some free time in the schedule for your personal independent exploration. Please note that program activities, schedules and personnel may need to change due to local circumstances. In the event of changes, we will alert you as quickly as possible. Thank you for your understanding. Note: Performances will be announced in the 2nd set of preparatory materials. Dinner: Three course plated and served dinner in the hotel's Waterside Brasserie. Tea, coffee and water included. Other drinks may be purchased. Evening: At leisure. You may wish to relax in the comfort of the Club or Champagne Bar or the Lounge. Day 3: Shakespeare's Family Homes, Performance: Stratford-upon-Avon. Breakfast: Full English and continental breakfast in the hotel. Choose from a variety of eggs, bacon, sausage, tomato, baked beans, hash browns, cold cuts and cheeses, toast, jams, marmalade, yoghurts, fruit, juices, teas and coffees. Morning: Your Shakespeare experience begins with Giles Ramsay's exploration of the Medieval Background to Shakespeare's Work and an introductory briefing on this evening's play. Lunch: Excluded so that you can sample the many restaurants, tea rooms, cafes and pubs in the town. Afternoon: Giles Ramsay takes you on a guided walk around central Statford-upon-Avon. Your group leader will give you the Shakespeare Five House Pass to Anne Hathaway's Cottage & Gardens, Hall's Croft, Mary Arden's Farm, New Place & Nash's House, Shakespeare's Birthplace and Shakespeare's Grave. Discover where the young William Shakespeare courted his future bride Anne Hathaway at her picturesque family home. Dinner: A pre-theatre dinner will be taken in a local restaurant. Evening: Enjoy a performance at the Royal Shakespeare Theatre. Full details of all performances will be available in your second set of Preparatory Materials, approximately 6 weeks before the programme. Day 4: Private Reception at Shakespeare's Birthplace: Stratford-upon-Avon. Morning: Giles Ramsay gives an illustrated lecture on Shakespeare's verse and Shakespeare's world. Lunch: On your own to enjoy the local fare of your chosing. Dinner: Food will be served at Shakespeare's Birthplace. Evening: Enjoy a private reception with wine and canapes at, the very special, Shakespeare's Birthplace-where it all began. This is the house where William Shakespeare was born, grew up and played. He ate meals in the hall and he slept and dreamt in these rooms. Shakespeare also spent the first five years of married life in this house with his new wife, Anne Hathaway. For millions of Shakespeare enthusiasts worldwide, this house is a shrine. Here you will discover the world that shaped the man and find out what other famous writers thought when they visited here. Follow in the footsteps of not only Shakespeare, but other well-known visitors such as Charles Dickens, John Keats, Walter Scott and Thomas Hardy. Shakespeare's Birthplace is a fascinating house that offers a tantalising glimpse into Shakespeare's early world. Visit the Shakespeare's Treasures Exhibition, where a new display of items is curated every 6 months. Day 5: Meet an RSC professional, RSC Rooftop Restaurant Dinner: Stratford-upon-Avon. Morning: Giles Ramsay in conversation with an actor or director from one of the plays you'll see. Lunch: On your own, your group leader will offer suggestions. Afternoon: On your own to explore Shakespeare's hometown. Dinner: Taken in the Rooftop at the RSC. Enjoy the very best of British food in relaxed, contemporary and stylish surroundings with stunning panoramic views from the third floor of the Royal Shakespeare Company's theatres in Stratford-upon-Avon with a terrace looking out onto the River Avon and surrounding countryside. Evening: Enjoy a performance at the Royal Shakespeare Theatre. Morning: Enjoy an expert-led exploration of the Royal Shakespeare Company's theatre. Discover the public and private areas of the theatre, learn about the origins of the RSC and its theatres in Stratford-upon-Avon and explore a production in more depth to learn about the theatre making process. As the RSC is a busy producing theatre company not all spaces, including the auditoria, will be available as part of a tour. Access to these spaces is subject to availability around rehearsal and technical work. Afternoon: The coach departs Stratford at 2:00pm for the transfer to London. Check-in at the London hotel and relax before dinner. Dinner: Early dinner in the hotel. Evening: Enjoy a Shakespearean performance at one of London's leading theatres. Breakfast: Full English and continental breakfast in the hotel. Morning: Multi-media Lecture by Giles Ramsay "Shakespeare's Plays in Production from his Death to the Present Day". Lunch: On your own to take advantage of London's diverse cuisine. Evening: Enjoy a performance at Shakespeare's famous Globe Theatre. Activity note: The Shakespeare's Globe site includes an open air theatre, the Exhibition, and Swan at the Globe Bar and Brasserie. The entrance to the Exhibition is accessed via a ramp on Bankside. It is fully accessible with lifts leading to each section of the Exhibition and up to the Globe Theatre piazza level. There is no lift serving the tours of the theatre, so if stairs are a problem please let the admission desk know and we can adjust the tour to take in your needs. Morning: Giles Ramsay lectures on A Tale of Two Genres: Revenge Tragedy and Masque. Afternoon: Take a field trip south of the River to Sam Wanamaker's Shakespeare's Globe and Exhibition. Shakespeare's Globe is a unique international resource dedicated to the exploration of Shakespeare's work and the playhouse for which he wrote, through the connected means of performance and education. The Globe stands a few hundred yards from its original site where pioneer American actor Sam Wanamaker rebuilt the iconic building. Other than concessions to comply with modern day fire regulations such as additional exits, illuminated signage, fire retardant materials and some modern backstage machinery, the Globe is as accurate a reconstruction of the 1599 Globe as was possible with the available evidence. The reconstruction is as faithful to the original as modern scholarship and traditional craftsmanship can make it, but for the time being this Globe is – and is likely to remain – neither more nor less than the "best guess" at Shakespeare’s theatre. Based under the Globe Theatre, our engaging and informative Exhibition explores the life of Shakespeare, the London where he lived, and the theatre for which he wrote. Imagine the Globe as it would have been: the centre of what was once London's most notorious entertainment district, surrounded by raucous taverns and bawdy-houses. Expert guides will take you on a fascinating tour of the iconic Globe Theatre, bringing the space to life with colourful stories of the 1599 Globe, of the reconstruction process in the 1990s, and of how the "Wooden O" works today as an imaginative and experimental theatrical space. Dinner: Dinner is taken out in a traditional pub. Lunch: A light lunch of soup and sandwiches in the hotel. Afternoon: A leading London theatre critic considers current trends in Shakespearian productions. Farewell meeting before dinner. Breakfast: In the hotel. Some transfers may depart before breakfast. Morning: Transfers by private car to London Heathrow Airport terminals. Situated in the heart of Shakespere country, the historic Alveston Manor Hotel is set in its own grounds just 5 minutes walk from all the cultural attractions of Stratford-upon-Avon and retains some 16th century original features. Most bedrooms are in the modern wing. Giles Ramsay is an independent theatre director and producer who specializes in creating new work with artists in developing countries. He is the Founding Director of the charity Developing Artists, a Fellow of St. Chad’s College, Durham University and Course Leader in Theatre at The Victoria and Albert Museum in London. He has devised and instructed on Road's Scholar programs since the early 1990's and has run theatre projects in countries ranging from Kosovo to Zimbabwe.